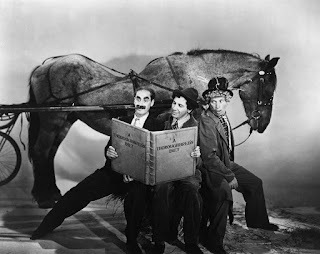 In Episode 3 of The Marx Brothers Council Podcast, actor / writer / director Frank Ferrante, the world's most renowned Groucho Marx impressionist, and star of An Evening With Groucho, joins us for a deep dive into A Day at the Races. Frank details his personal history with the film, and we mercilessly dissect it. Noah reveals a surprising secret and, later, Frank answers questions from Council members. Click here to download an MP3 directly to your computer. Click here to stream the episode via Cast. Click here to stream the episode via YouTube. Click here to stream the episode via SoundCloud. Click here to listen and subscribe via iTunes. Click here to listen and subscribe via Google Play. Click here to listen and subscribe via Stitcher. Click here to listen and subscribe via Blubrry. Or stream from this page below. 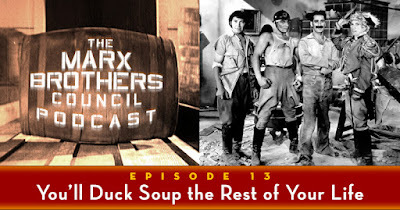 Discuss this episode in the comments here, and at The Marx Brothers Council Facebook group. And if you like our podcast, please talk about it incessantly everywhere you go, giving the people in your life no choice but to join our army of loyal listeners, or to shun you completely. Quite enjoyable to sit through this hour-plus podcast while lying in bed this morning. As I have said before (and will say again), I love most of the comedy scenes in Races, and especially how they seem to get more and more raucous as the film goes on. The problem is - the film goes on and on and on... Once the Brothers jump on Hi-Hat and ride out of the examination room, the movie is over for me. But compared to the Opera comedy scenes, a couple of which are nothing but two people talking, the Races comedy scenes are more fun. But Opera holds up much better as a movie. An excellent podcast with a balanced, perceptive critique of ADATR and great to hear Frank Ferrante's views on the film and playing Groucho. I feel the three casters are just hitting their stride so I can't wait for episode 4. Wonderful epuside - fun to hear Frank's input. The part about "Races" that always bothers me is the scene where Chico writes the telegram. He tells Judy "If she wants a Hackenpuss, she gonna get a Hackenpuss." And then he writes the telegram for Hackenbush. Discovered this podcast series this morning, and have been plowing through them to catch up as quickly as possible. I'm enjoying them very much. I am also perfectly comfortable with the 3 casters often agreeing; I simply enjoy the conversation. I am 41, and first discovered the brothers around the age of 8. My parents had VHS taped 4 movies that had played on TV late one night. They were Monkey Business, Horse Feathers, Duck Soup, and Room Service. One viewing and I was hooked. I then watched that tape dozens of times, likely passing 100. As I've aged, I like how I was able to enjoy them as an 8-year old, only getting a few jokes, then enjoy them at any later age, each time picking up something new. I now marvel at how good they were in terms of their delivery, timing, et cetera, particularly compared to EVEN very good comedians and actors of today. ANYWAY, keep the good work; looking forward to the upcoming episodes. Thanks for listening, Adam, and for all the kind words! It's true, the Marxes' work is endlessly rewarding and renewing; we grow with the films, rather than outgrowing them -- a sure sign that the boys have given us not just great entertainment but great art. I recently had to wake up very early and, as I ate breakfast, watched part of "A Day at the Races" on TCM -- right at the beginning of Harpo's examination scene. I hadn't seen the movie in a long time, and my memory was negative toward it, but I was struck by how funny it was. I have a feeling if you simply fast forward just to the Marx scenes, it would rank as one of their top 3 funniest movies. I'm fine, who are you?